LAWRENCE, Mass. 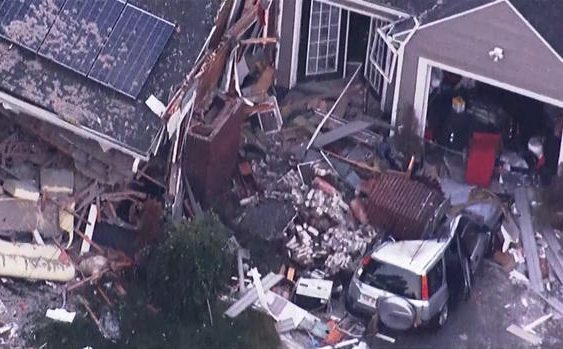 — Residents in communities north of Boston that were rocked by natural gas explosions were given the green light Sunday to return to their homes. Gov. Charlie Baker and other officials announced the move at a morning news conference and said electricity was restored to nearly all affected homes and businesses in Lawrence, North Andover and Andover. Gas service will remain shut off while officials continue investigating what caused Thursday’s explosions and fires, and crews inspect the gas lines and connections to homes. Dozens of homes were destroyed or damaged, a teenager was killed and dozens of people were injured. Thousands of residents were forced to evacuate. Crews have shut off nearly 8,600 gas meters in the area and cleared homes of any gas. Damage to a house in Lawrence, Mass., after a series of gas explosions and fires in the area on Sept. 13, 2018. Firefighters in Lawrence responded to a fire at an apartment complex Sunday morning after residents had returned, but officials said it wasn’t related to the gas problem. He said investigators will be looking at how local Columbia Gas officials responded to a “pressure increase” in the Lawrence area that was detected at the company’s pipeline control center in Columbus, Ohio, prior to the explosions and fires. Government records reveal at least three other serious explosions in Massachusetts, West Virginia and Ohio have been linked to Columbia Gas. The company a subsidiary of NiSource, a utility company that serves more than three million customers in seven states. Lawrence Mayor Dan Rivera became emotional at the news conference while thanking people for support and donations to the Lawrence Emergency Fund.